When he was only 5 years old, Messi started playing soccer for Grandoli, a local club coached by his father Jorge. In 1995 young Lionel Messi switched to Newell's Old Boys who were based in his home city Rosario. During his time at Newell's Old Boys young Messi was diagnosed with growth hormone deficiency at the age 11. After sparking interest from River Plate, one of the top clubs in Argentina, River Plate did not want to sign Messi due to his condition and the club not wanting to pay $900 monthly for Messi's treatment. Because of family ties in Lleida, Catalonia and the sporting director of Barcelona Carles Rexach being aware of Messi's talent, young Messi and his father aranged a try-out with FC Barcelona. After the tryout it has been roumored that Barcelona sporting director Carles Rexach offered Messi a contract written on a paper napkin since he had no other paper on hand. Barcelona also agreed to pay for Messi's hormone growth deficiency treatment if he was willing to move to Spain and join the youth Barcelona team which marks the start of Lionel Messi biography at Barcelona. Messi joined FC Barcelona youth academy in 2000 playing for Barcelona junior Infantil B and Cadette B & A teams from 2000-2003, scoring 37 goals in 30 matches while playing for Barcelona Cadette A team. During the 2003-2004 season Messi played for Barcelona's 5 different teams. He started to play for Juvenil B, got promoted to Juvenil A scoring 21 goals in 14 matches earning another promotion to FC Barcelona C team (Tercera or 3th division) where he kept scoring goals earning a spot on Barcelona's B team (2nd Division). Important to mention in this Lionel Messi biography is that during the 2004 season Messi played for both C and B team. Messi would make his debut appearance for Barcelona's A team on November 16th, 2003 when he was only 16 years and 145 days old in a friendly match against Porto. Less than a year after his friendly debut, Messi was given the chance by coach Frank Rijkaard to make his league debut against RCD Espanyol on October 16th, 2004 when he was only 17 years and 114 days old making him third youngest player to ever play for Barcelona and youngest club player to play in La Liga. Youngest player to play in La Liga record was later broken by his teammate Bojan Krkic in 2007. Lionel Messi biography shows him scoring his first goal for FC Barcelona when he was 17 years, 10 months and 7 days old becoming the youngest player to ever score a goal for Barcelona. Bojan Krkic would again brake this record by scoring a goal for Barcelona in 2007 on a Messi assist. During the season Messi also played for the Barcelona B squad scoring 6 goals in 17 matches. On September 16th Barcelona announced an update in young Messi's contract paying him as a first team member and extending his contract with the club until June 2014. His first team home outing came on September 27th, 2005 in a Champions League match against Italian side Udinese. Messi was given a standing ovation by Barcelona fans upon his substitution. Lionel Messi Biography shows him scoring 6 goals in 17 league appearances and 1 goal in 6 Champions League matches during the 2005-06 season. His season was ended prematurely on March 7th, 2006 when he suffered a muscle tear in his right thigh during the Champions League match against Chelsea. Barcelona went on to win La Liga and Champions League title. Lionel Messi would establish himself as a Barcelona regular first team player scoring 14 goals in 26 matches but would again be sidelined for 3 months on November 12th when he suffered a broken metatarsal (broken foot). Messi made his comeback on February 11th, three months after his injury, against Racing Santander coming on as a second half substitute. Lionel Messi Biography shows him scoring his first hat trick (3 goals) on March 11th, 2007 in an El Clasico match against Real Madrid. Barcelona played with 10 men equalising 3 times throughout the match with the final equalisier coming in injury time of second half when Messi scored his third goal to end the match at 3-3. Messi became the first player to score a hat trick in El Clasico since Ivan Zamorano did it for Real Madrid in 1994-95 season. He was also the youngest player to have ever scored in this fixture. Lionel Messi biography shows that he ended the 2006-07 season with 14 league goals, 11 of which came during the last 13 games. On April 18th, 2007 Messi scored two goals in a Copa del Rey semi final against Getafe CF, one of which was almost identical to Maradona's famous goal against England at the 1986 World Cup in Mexico when he dribbled six players before scoring a goal. Maradona's goal had been marked as the "Goal of the Century". Messi ran the same distance, beat the same number of players (6 including the goalkeeper), scored from a similar position and ran towards the corner flag just as Maradona did 21 years before. During the same season in a match against RCD Espanyol Messi menaged to score another goal which was remarkably similar to Maradona's "Hand of God" goal against England in the 1986 World Cup quarter finals. Messi lauched himself at the ball clearly scoring with his hand and despite protests by Espanyol players and replays showing that it was a clear handball, the goal stood. Messi continued his great form during the 2007-08 season scoring five goals in a week to lead Barcelona to the top four in La Liga. On February 27th, 2008 Messi recorded his 100th official match for Barcelona against Valencia. He kept scoring goals and providing assists in both La Liga and the Champions League matches leading him to nomination for FIFA Pro World XI in the position of a Forward. An online poll by the Spanish newspaper Marca had Messi winning 77% of the votes for Best Player in the World. Columnists from Barcelona based newspapers El Mundo Deportivo and Sport stated that the Ballon d'Or should be given to Lionel Messi. This was also supported by FIFA's Franz Beckenbauer. Lionel Messi biography shows that another injury sidelined young star for six weeks when he suffered a muscle tear in his left thigh during a Champions League match against Celtic on March 4th, 2008. This was the fourth time in 3 seasons that Messi suffered this type of injury. After coming back from the injury, Messi scored his last goal of the season against Valencia CF on May 4t, 2008 in a 6-0 win. He managed to score 16 goals and provide 13 assists in all competitions for 2007-08 season. Lionel Messi started wearing famous number 10 after Ronaldinho's departure from the club at the beginning of 2008-09 season. He kept finding good form scoring goals and providing assists. On October 1st, 2008 Messi scored two goals against Shakhtar Donetsk in the last seven minutes to turn a 1-0 deficit to a 2-1 victory for Barcelona in this Champions League match. On December 13th, 2008 Messi scored the second goal in the first El Clasico of the season against Real Madrid to win the game 2-0. He was a runner up in the 2008 FIFA World Player of the Year. Lionel Messi biography shows him scoring his first hat trick of 2008-09 season in a Copa del Rey match against Atletico Madrid helping Barcelona win the game 3-1. In the 28th round of La Liga Messi scored his 30th goal of the season in all competitions. He set a new personal record of eight goals in the Champions League after scoring twice against Bayern Munich on April 8th, 2009. As the season was coming to an end, Messi hit the back of the net twice in the second El Clasico to help Barcelona win the game 6-2 over Real Madrid and add his 36th goal of the season in all competitions. This was also the heaviest defeat for Real Madrid since 1930. Lionel Messi biography shows that his first Copa del Rey title came on May 13th, 2009 after scoring one goal and providing two assists for a 4-1 final win against Athletic Bilbao. Right after Copa del Ray title, Messi was celebrating winning Spanish La Liga. On May 27th, 2009 Lionel Messi helped Barcelona win the Champions League title after scoring the second goal in 70th minute to give Barcelona 2-0 advantage in the final against Manchester United. Lionel Messi biography shows that he also became the youngest top goal scorer in Champions League with 9 goals. He won the UEFA Club Forward of the Year and the UEFA Club Footballer of the Year rounding of a spectacular year in Europe and Spain. Lionel Messi was part of Barcelona's win in Copa del Rey, La Liga and Champions League setting a record for the first time a Spanish club had ever won a treble title. After successful 2008-09 season Barcelona Manager Josep Guardiola stated that Lionel Messi is the best player he had ever seen. On September 18th, 2009 Lionel Messi signed a new contract with Barcelona tying him to the club until 2016. His contract included a buy out clause of €250 million ($400 million) making him, along with teammate Zlatan Ibrahimovic, highest paid players in La Liga earning around €9.5 million ($15 million) yearly. Lionel Messi scored six goals in the first 7 matches of La Liga and on December 1st, 2009 he won the 2009 Ballon d'Or beating runner up Cristiano Ronaldo by largest ever margin of 473 points to Ronaldo's 233 points. On December 19th, 2009 Messi scored the winning goal in the final against Estudiantes for the 2009 Club World Cup tournament held in Abu Dhabi to give the club their 6th title of the year. Two days later Lionel Messi biography is enriched with his first ever FIFA World Player of the Year award making him the first Argentine player to ever receive this award. Messi scored his first hat trick of the season on January 10th, 2010 against CD Tenerife and one week later on January 17th, 2010 Lionel scored his 100th goal for Barcelona in a 4-0 victory over Sevilla. After his 100th goal, Messi started an impressive goal scoring streak with 11 goals in 5 matches. His 200th match for Barcelona came on March 24th, 2010 against Osasuna. Messi scored four goals in one match for the first time during a Champions League quarter final against Arsenal on April 6th, 2010. With those four goals came another record breaking moment overtaking Rivaldo as Barcelona's all time leading scorer in Champions League. At the end of season Messi had scored 34 goals to tie Ronaldo's club record of 34 goals in a single season set in 1996-97 and to finish four goals behind all time record held by Telmo Zarra. Lionel Messi biography shows him taking the second La Liga Player of the Year award in a row on June 3th, 2010. Lionel Messi started the season off with a hat trick in a 4-0 victory over Sevilla FC during the Supercopa de Espana helping Barcelona win their first trophy of the season. Lionel Messi biography shows that he also scored a goal in his first La Liga match only 3 minutes into the match against Racing Santander on August 29th, 2010. His great form continued with two goals, two assists and two shots on the frame of the goal in the UEFA Champions League match against Panathinaikos. September 19th, 2010 was a scary moment for Lionel Messi and Barcelona when Atletico Madrid defender Tomas Ujfalusi came in with a harsh tackle on Messi in the 92nd minute of the match. At first sight it seemed that Messi had his ankle broken which would keep him out of action for at least six months but after performing an MRI the next day Barcelona and Lionel Messi were relieved to find out that it wasn't a broken ankle but he did suffer sprain in the internal and external ankle ligaments. In his first match back from the injury Messi continued his scoring form with a goal against RCD Mallorca to tie the game 1-1. He would go on to score a goal in the next 7 consecutive matches breaking his own previous record of scoring in 6 consecutive matches. Lionel Messi biography shows him scoring his 100th La Liga goal against Almeria and also his 50th goal in the Calendar year of 2010. He would than brake his own record again set earlier this season of scoring in 7 consecutive matches by scoring in 9 consecutive matches as the season came to a close. Messi's goal scoring run was ended in the El Clasico against Real Madrid on November 29th, 2010 where he provided two assists to teammate David Villa helping Barcelona win the game 5-0. His first goal of 2011 came against Deportivo La Coruna with a free kick in a 4-0 away win, he also assisted twice in this match. Lionel Messi biography shows him winning the 2010 FIFA Ballon d'Or for the second time beating teammates Xavi and Iniesta. He was nominated for this award for the fourth consecutive year. Only two days after winning FIFA Ballon d'Or he scored his first hat trick of the year against Real Betis. He scored a goal in the second round from the penalty spot against Racing Santander where he revealed a message on his undershirt that said "Happy Birthday Mami". Messi kept scoring goals and on February 5th, 2011 he helped Barcelona brake the record for most consecutive league wins with 16 victories after they defeated Atletico Madrid 3-0 at Camp Nou. Messi continued scoring more goals helping Barcelona brake another record for most Unbeaten Away matches set in 1979-80 season by Real Sociedad. Messi scored the only goal in the Away victory against Valencia to make it 20 unbeaten away matches surpasing Real Sociedad's 19. Messi scored two more goals in a UEFA Champions League match against Arsenal to help Barcelona advance to the quarter finals. On April 23th, 2011 Messi scored his 50th goal against CA Osasuna breaking another record for most goals scored in all competitions during a single season for Barcelona. Messi scored a memorable goal in the Champions League semi finals against Real Madrid where he dribbled past several players before scoring his second goal of the game to win the game 2-0. He than scored a game winning goal in the final to give Barcelona their third Champions League Title in six years. Lionel Messi biography continues with his first match for Argentina in an Under 20 friendly match against Paraguay in June, 2004. Messi was also part of a Youth Argentina team that won the 2005 FIFA World Youth Championship held in Netherlands. Young Lionel Messi was the top goal scorer and the best player of the tournament scoring 6 goals and winning Golden Ball and the Golden Shoe. Messi was 18 years old when he made his first team debut for Argentina on August 17th, 2005 against Hungary. It kind of funny that Messi came in as a substitute in the 63th minute only to be sent off in the 66th minute because of headbutting another player. Lionel Messi biography shows him earning the starting position for Argentina's first team in the next game against Peru. World Cup Qualifier against Venezuela on March 28th, 2009 was the first time Messi put on a jersey with a #10 on it. He scored the opening goal helping Argentina win the game 4-0. Injury from 2005-06 season almost kept Messi from participating in the 2006 World Cup. He made his debut in the second match against Serbia and Montenegro as a substitute in the 75th minute becoming the youngest player to ever represent Argentina at the World Cup. He assisted Hernan Crespo within minutes of coming on and also scored the last goal to seal a 6-0 victory. Messi became the youngest player of the tournament to score a goal and also 6th youngest player to score a goal in the history of World Cup. Messi was on the bench during the quarter final match against Germany which they lost 4-2 after penalties. Lionel Messi biography shows him making his first for Argentina in the 2007 Copa America. Messi's play-making abilities helped Argentina reach the finals but would lose the final match 3-0 against their South American rival Brazil. 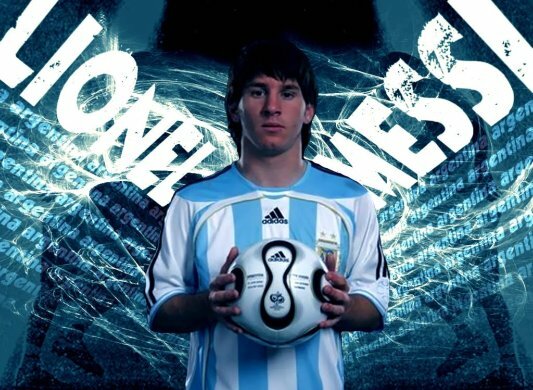 Next international competition for young Messi was the 2008 Summer Olympics where he scored in the opening match against Ivory Coast to help Argentina win the game 2-1. He than scored a goal and provided an assist for teammate Angel Di Maria in the second match to help his side win the match 2-1 in extra time against Netherlands. During the final against Nigeria, Messi provided an assist to Angel di Maria who scored the only goal of the match to win the Olympic Gold Medal. 2010 World Cup was very successful for Messi as he was being the centrepoint of Argentina's attack. He was voted Man of the Match for Argentina all through out the tournament. Argentina and Lionel Messi were knocked out during the elimination quarter final round against Germany. It was a catastrophic 4-0 loss. 2011 Copa America was held in Messi's home country Argentina. Although he was named man of the match in two different matches, Messi couldn't help Argentina advance past the quarter finals in a penalty shootout loss against Uruguay.